Water Heaters That Meet All Your Needs!!! Produce more hot water using less energy than the most efficient storage tank style heater. Tankless water heaters save energy, save space, and save you money! Tankless water heaters heat the water you need, when you need it. Turning any water source into hot water on demand. Hot water is not limited to the amount a storage tank heater can hold. Whether you are washing the dishes, washing your clothes, or drawing a hot bath, tankless water heater technology will give an endless supply of hot water to meet your lifestyle demands-even if you do them all at once! up to 40 % energy savings. Our units are designed to be highly efficient and only heat water when it is needed, a revolutionary advantage over inefficient tank-style heaters. 2x tankless water heaters have a typical life of up to 20 years. This can be twice as long as a tank style unit! Most brands we install have an ENERGY STAR approval by meeting the strict energy efficiency guidelines set by the U.S. Environmental Protection Agency and the Department of Energy, by using less energy and preventing greenhouse. Specializing in all Water Heater repair and installation, we are the hardest workers in the business! Fast Response water heater repair and installation is a full service residential and commercial water heater contractor dedicated to providing service that’s as unbeatable as our rates. Same Day ServiceTanklessNo Storage, No ShortageNo Dirty TanksLower Water Heating CostsDurability.Fast Response Water Heater, repair and maintain tankless water heaters in San Mateo, Redwood City, Belmont, Palo Alto, South San Francisco, Burlingame, Millbrae, and the city of San Francisco. With Fast Response tankless water heater, you’ll save energy and thus, money. Our on-demand systems require no pilot light and can save about half the cost of your current water heating bill since there is no re-heating of water as with traditional water heaters. 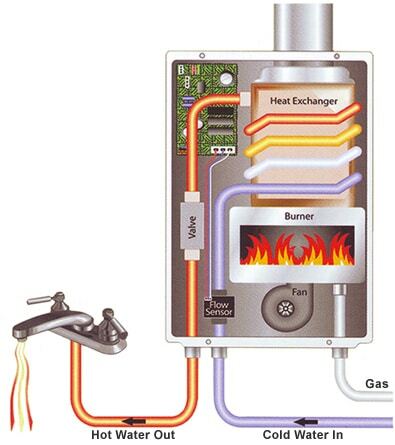 The most popular advantage of tankless water heaters in San Mateo or surrounding areas that you will never run out of hot water. This is because tankless water heaters heat water on demand, and that means no storage or shortage of hot water. Imagine the luxury of always having hot showers or filling up a Jacuzzi hot tub and still having endless supply of hot water for the rest of your household needs. It’s about time your home had equal supply of hot and cold water. Water Heater Manufacturers, Brands and Resellers. Best Rated Water Heaters. Brands we use and buy our products from.